A PPS team has touched ground in Indianapolis today to celebrate the City’s second annual Placemaking Day! 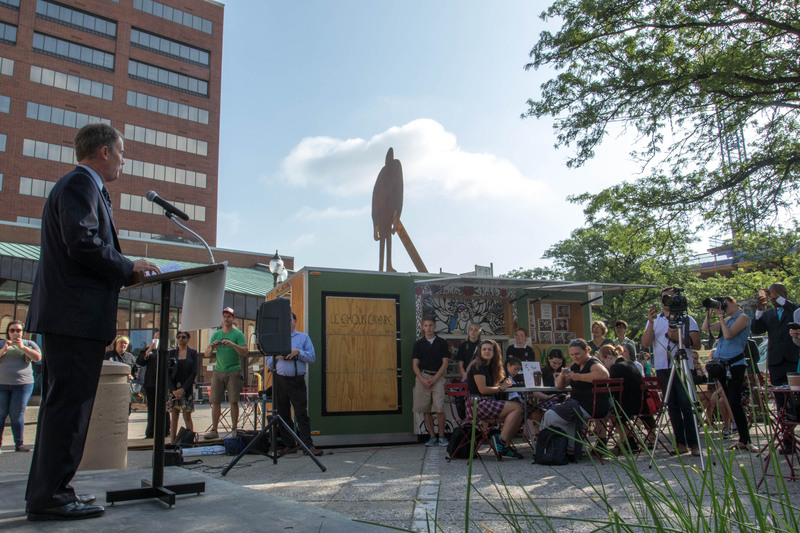 The event, which explores the role of art and culture in activating great public spaces in the community, evolved as part of a joint effort between Indianapolis City Market, Big Car Collective, Downtown Indy, Southwest Airlines, and Project for Public Spaces. The celebration kicked off this morning with a yoga class held by the Bike Hub YMCA, followed by statements from Southwest, PPS, and local officials on Indianapolis City Market’s East Plaza. Activities will continue throughout the day, including the Original Farmers’ Market launch, live music, more public fitness classes, afternoon Bocce ball and other games, a pop-up opera, and an evening dance party through Naptown Stomp as well as a Tomlinson Tap Room beer garden. After joining forces in 2015 to enhance and connect the City Market Plaza with Monument Circle—two prime downtown sites within a five-minute walk of one another—in 2016 Indianapolis City Market and Big Car Collaborative received a grant from the Southwest Airlines Heart of the Community Program (#SouthwestHeart) to help them implement their plans to engage the public and enliven the public spaces in the emerging Market East District. The results of this work have been phenomenal, and Indianapolis Placemaking Day is the perfect way to celebrate the strong connections between Indianapolitans and their city, and the remarkable sense of community that has been reinforced through the co-creation of great public spaces over the last several years.